4 August 2018 at the Taj of India in Arlington, Virginia. See their 2006 Reunion photo. AISAES alumni cruised together from Seattle, Washington, to Alaska, 3-10 June 2017. Seven wonderful days on Holland America Cruise Line on the Majesty Ship, "Eurodam," exploring Juneau, Glacier Bay, Sitka, Ketchikan and Victoria (Canada). Thank you, Erik and Terri Kelly Jones ('79) and Cruises, Inc. for setting this cruise up for us. More photos to come but here's a photo from Gala Night on the ship. (Please click on photo for enlargement). in Portland, Oregon. Clockwise (l-r): daughter, Michelle (middle child); husband, Dave; son, Matthew (oldest child); Mary; daughter, Marie (youngest child). Mary Williamson was presented an award, the Military Spouse Medal, at her husband's retirement ceremony on 13 September 2013 at the Air Force Memorial in Arlington, Virginia. I've shared with my classmates my journey as an Air Force spouse for 31 years and thought it only fitting to also share this particular milestone. Today (13 SEPT 2013) was my husband's retirement ceremony at the Air Force Memorial in Arlington, Virginia, which was attended by our closest family and friends. He will officially retire on 1 NOV 2013 as a Command Chief Master Sergeant in our United States Air Force. So far, he is the only Explosive Ordnance Disposal (EOD) technician from all four branches of our military to make it as a Command Chief and at a Major Command level. I'm so proud of my husband's 31 years of outstanding service. In this photo, I was just presented a special award, the Military Spouse Medal, by the Chief Master Sergeant of the Air Force (left) for my contribution and service to the Air Force over the years. As an EOD spouse, I led an explosive life! "EOD...FIRE IN THE HOLE!" This award was presented to me as a surprise at the USAFE Command Chief Farewell Dinner that the Commander hosted for my husband and me at a restaurant inside a big, beautiful castle in Ramstein. Please click on images to view them enlarged. -- when my husband reaches 30 years of service (the maximum time the Air Force will allow one to serve). He was given a special extension on his high-year tenure to take a one-year special-duty assignment to the Pentagon as "Chief of Air Force Resiliency Operations." He will help head that team, and this will give us an opportunity to get settled stateside before he retires. His retirement date has been extended to 1 NOV 2013! All is good, and we are happy to continue serving one more year. We are also looking forward to our first experience living in the National Capital Region! We will miss our United States Air Forces in Europe (USAFE) Family...thanks to our airmen for their hard work and dedication to make our Command the best. Mary Williamson (Class of 1974), who is stationed at Ramstein Air Base, Germany, poses with actor Tom Cruise on 11 December 2011 when he stopped through to visit the wounded warriors at Landstuhl Regional Medical Center and to promote his new movie, Mission Impossible: Ghost Protocol. AIS alumni Mary Williamson (second from left), currently stationed at Ramstein Air Base, is a big fan of the television show Dancing with the Stars, stands with Chelsie Hightower (left), a Latin ballroom dancer; Tristan McManus (second from right), an Irish ballroom dancer; and Peta Murgatroyd, a classical ballet dancer. Please help us welcome Mary Williamson, Class of 1974, as the new President of the AIS/AES Alumni Association. Mary joined our Board in 2005. Born in Hong Kong and adopted at age 3 to State Department parents, Mary has two older sisters who did not attend AIS/AES and a younger sister, Ellen, (’76) who did attend our school. She and her sister were raised in Indonesia, Iran and India (both Calcutta and New Delhi). At AIS New Delhi, Mary was active with cheerleading, basketball, swimming, horseback riding and the yearbook club. Mary has three beautiful children (now young adults) and is married to David Williamson, the Command Chief Master Sergeant for U.S. Air Forces in Europe. Mary and Dave recently moved from Hawaii to Germany, where Mary is very active with supporting our military families in Europe. As Dave’s wife, she represents the military spouses and families, helping to make sure their needs are being met. She leads a number of various organizations and activities for our military families and is constantly on the go! When we told Mary we were going to publish a welcome message to her on our website, she asked that we extend her thanks to all the amazing class secretaries who have worked hard to push our communications to the alumni community. “The class secretaries are an important part of our leadership team. Without their help, we wouldn’t have had the success at our all-school/all-classes-invited reunion that we did.” She also wishes to again thank everyone who helped make the 2010 Reunion a success “It was really wonderful how our alumni came from all directions to pitch in for the reunion. It just goes to show what we can do when we pull together as a team." New Board President Mary Williamson (Class of 1974) talks to a little girl at a military base child development center, during a recent tour of Combat Support Wing bases in the United Kingdom. Mary's husband is the current United States Air Forces in Europe (USAFE) Command Chief, and they are both a leadership team who represent the enlisted airmen and their families. Mary Flanagan Williamson, Class of 1974, writes, "When I was on a business trip to Singapore I looked up classmate Mike Fink (who currently lives there with his wife and teenage children); and we had a wonderful visit over lunch on 13 February 2010 in a Chinese restaurant. 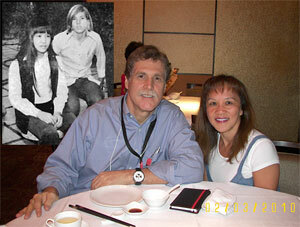 I thought maybe it would be fun - even entertaining - to put our "THEN AND NOW" photos up on the web site." Mary Flanagan Williamson, Class of 1974, with her husband, Dave, at the Magic Kingdom in Orlando, Florida, on 14 March 2009. Dave, a U.S. Air Force Command Chief Master Sergeant, was on furlough from his current deployment in Iraq. in Boston, Massachusetts, on 15 April 2008. I attended the American International School of Calcutta (AISC) before attending AIS in New Delhi. AISC just had their first-ever Reunion Weekend, 14-16 July 2006, and it appeared to be successful! Everyone met in Philadelphia, Pennsylvania, and pretty much took over the downtown Historic District! We had our "Meet-N-Greet" reception on Friday night at the hotel, had our big Saturday night "AISC Family" dinner at a nearby Indian restaurant, and had our "So-Long, Farewell Brunch" on Sunday at the hotel. That time period in Calcutta, in the late 60's, is now a small sliver in our lives; but the turnout showed that it had a huge impact on all of us. (l-r): Barbara McCabe, Alan Egler and Mary Flanagan Williamson attended AIS in Calcutta and New Delhi. It was really fun to notice hardly any time had passed by between us as we talked about AISC...Calcutta...India, in general... You could see everyone reconnecting while reminiscing. Alumni were pulling out old photos, yearbooks, and memorabilia; there was a lot of laughing; there were tons of photo flashing; and we even had several "class photo sessions!" Along with myself being a student who attended both AISC and AIS-Delhi were Alan Egler ('74) and Barbara McCabe ('76). It was truly an amazing and fun experience. Editors note: In addition to being the organizer of the Calcutta reunion, Mary is class secretary for AIS New Delhi Class of 1974. She has done a tremendous job getting biographies from many of her New Delhi classmates, and also keeps a list of her classmates still needing to be "found." Thank you, Mary! Mary (Flanagan) Williamson with her husband, Command Chief Master Sergeant David Williamson, on their wedding day, May 10, 2006. See their Marriage Announcement by email. Big news from the Class of 1974!! I was married on Wednesday, 10 May 2006, in Mount Laurel, New Jersey, to David Williamson in a small private ceremony amongst friends!! Dave is the 621 CRW Command Chief at McGuire AFB. We have been in New Jersey almost a year now. We will probably be here until summer 2007 or 2008 as Chief assignments are usually two years, but no longer than three. I will now go by the name MARY WILLIAMSON and will keep the same email address. To flash back big time, I was in India for a total of six years�four years in Calcutta, two years in New Delhi. I was in New Delhi from 1971-73 and attended 10th and 11th grades at AIS. I did my senior year (and graduated!) in Washington, DC, and then spent a year in college in Indiana. I decided college was not for me and went to a voc-tech school for a year to train as a legal secretary. My first marriage was in 1976 and ended in 1996. Twenty years! That marriage produced a son and two daughters. They are now young adults, one working and two in college. Their father moved to Oregon, where he was hired for his first civilian job after retiring from the US Air Force. My biggest regret in life is not having joined the US Air Force myself. I always wanted to enlist but did not. I did the next closest thing and worked as a civilian for the Air Force for most of my adult years. However, since moving to New Jersey last summer (from Utah), I have not worked outside the home but intend to look for employment again soon. As mentioned earlier, Dave - who could retire from the Air Force anytime now but can max out for another seven years - is not sure how long we will be stationed in New Jersey. I have enjoyed my role as class secretary for the past year for the Class of 1974 and am trying my best to keep us all connected! I also stay active with our sister school, AIS-Calcutta, where I attended school four years prior to AIS-Delhi. Two years ago I created their alumni program and dubbed it "GoAISC". I still run the program single-handedly. This summer I am hosting and organizing the first-ever Calcutta reunion in Philadelphia, Pennsylvania. For GoAISC and my AIS-Delhi classmates, I try to publish each an informal newsletter twice a month. In addition, I am the director of a new program McGuire AFB has implemented to help aid spouses of deployed men and women, called "Hearts Apart." I like being a mentor and also lining up activities, field trips, and socials for these spouses. I've enjoyed substitute-teaching aerobics classes as of lately. I've been asked to take up a class; but I'm not sure, after 12 years of teaching, that I want to commit to my own again. For now, I am content staying a substitute instructor! Hard to believe this year most of us in the Class of 1974 will be reaching another milestone by turning 50 years old! But life for me is great now, and I have no complaints. I hope the same goes for you. See also Mary and Dave's Marriage Announcement by email.